An exotic honeymoon resorts selection includes a wide choice of naturally inspired, chic and exotic resorts, private tours, and other honeymoon ideas, be it in pure luxury style or that of a more adventurous one together with privacy and exclusivity along with elegance, fine gourmet dining and impeccable accommodations. What could be more romantic than a secret private island? Or more enchanting than a floating palace; a water bungalow, surrounded with nothing but the crystal clear turquoise waters of the shallow waist-deep lagoon? Located southwest of India, the Maldives is a group of nearly 1,200 small coral islands that form an archipelago of 26 atolls spread out over the turquoise waters of the Indian Ocean. Each resort is set on its own island, offering seclusion and privacy, and many are well known for having some of the largest and most luxurious over-water villas of any island destination. 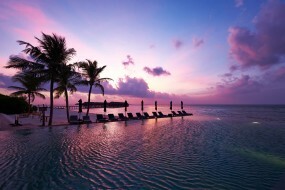 Always natural, promising you a holiday of a lifetime, Maldives is truly the ultimate in long haul luxury. With pristine white sandy beaches, azure blue lagoons, palm fringed islands and deep blue Oceans, Maldives offers breathtaking nature and sheer beauty. Powder-soft beaches with spectacular ocean views lead to beautiful lagoons and beneath the water, the coral coastline forms an intricate underwater paradise resplendent with marine life. With its warm temperature and exceptional clarity, the water off the Maldivian coasts is renowned for breathtaking snorkeling and diving spots. Endless skies and crystal waters in shades of blue edged by white sands soft as powder are surely the ultimate fantasy for romance. Banyan Tree Vabbinfaru has received several awards since it’s founding in 1995. Recognized for its superior comfort and seclusion, it has steadily increased its foothold in the minds of those seeking the ideal beach getaway. Each award-winning villa is uniquely designed to reflect the spiral of a seashell. The understated elegance of the conical thatched-roof villas of Banyan Tree Vabbinfaru imparts a sense of traditional Maldivian magic. Banyan Tree Vabbinfaru is designed following the Asian village concept, a cluster of one-storey wooden structures covered by thatched roofs. Designed for seclusion and privacy, guests can unwind in their little haven, undisturbed. Four Seasons Resort Maldives at Kuda Huraa is a vibrant garden island with all the charm and intimacy of a traditional Maldivian village; just 25 minutes from the airport. Adopt an entire ocean lifestyle at the Resort’s ‘Tropic surf’ Surf School. Sail by dhoni to The Island Spa – the only spa in the Maldives on its own private isle. Retreat to traditional land and sea-based accommodations interspersed with fragrant borders of bougainvillea, frangipani and hibiscus flowers. As the setting sun paints the endless sky, the Sunset Lounge epitomizes the Resort’s laid-back and sociable vibe. Discover a more intense experience of nature at this remote island resort in the pristine Baa Atoll, a UNESCO World Biosphere Reserve. Flanked by flawless white beaches and a two-kilometer lagoon, the island’s 44-acre jungle interior hides vast accommodation compounds and four isolated restaurants, inviting a real sense of discovery. Snorkel with turtles and rays on the kaleidoscopic house reef or join pioneering research projects in the Marine Discovery Centre, including coral reefscaping and the country’s only full-time manta ray project. Immerse in the healing heart of the Spa and Ayurvedic Retreat, with all-inclusive 7, 14 and 21day programs supported by two ayurvedic physicians and ayurvedic cuisine. Formerly known as Soneva Gili by Six Senses, Gili Lankanfushi™ is set on the private island of Lankanfushi in the North Malé Atoll. This luxury resort is just a 20-minute speedboat ride from the International Airport at Malé, the capital of the Republic of Maldives. This 5-star resort is set on the private tropical island of Lankanfushi in the Malé Atoll, one of the 19 atolls that stretch over 800 kilometers through the Indian Ocean. It is one of the 1190 islands that make up the Maldives. The resort is hidden away on the southern end of the Maldives, on the Gaafu Alifu Atoll. Get a bird’s eye view of this incredibly country as you fly over islands on a 55-minute domestic flight from Male to arrive at the Kaadedhdhoo Airport. Arrive at the resort by a 20-minute speedboat ride. Season’s l the weather in the Maldives is generally pleasant with balmy mornings, sunlit days, iridescent sunsets and breezy nights. With the average temperature at about 30°C throughout the year, Maldives has two distinct seasons; the dry northeast monsoon from December to March and the wet southwest monsoon from May to November. April is a transitional period between the two seasons with occasional thunderstorms that offer a welcome respite from the sun. One & Only Reethi Rah, Maldives is located on North Male’ Atoll, one of 26 natural atolls scattered across 90,000 square kilometers of Indian Ocean. Its spectacular shape creates six kilometers of stunning coastline with 12 beaches – ample space to grace each and every villa with an ocean view, a generous private verandah, and over-water deck or stretch of powder-soft sand. The 35 kilometers between the resort and Male’ International Airport are swiftly covered by a 75-minute journey in a 55-foot luxury yacht. All transfers are arranged around flight schedules. There are two main seasons in the Maldives. From December to May it is sunny and fairly dry. From June to November occasionally there are brief downpours followed by sunshine. Temperatures range from mid-20s to mid-30s centigrade and peak in April and May. The local currency is the ‘Maldivian Rufi yaa’ (MRf), whilst US Dollars are used at the resort. Taj Exotica Resort & Spa spreads idyllically along a pristine beach and the serene lagoon. The award-winning resort, now re-launched, seamlessly extends the magic of the island’s blessed natural beauty in its design even as it offers the finest contemporary luxuries and services. Taj Spa, an authentic Indian spa, offers a range of signature wellness experiences. A choice of gourmet cuisine, water sports, and recreation make for a complete and exclusive destination. Velaa Private Island is the realization of a dream to create a ‘beyond luxury’ ultra-exclusive boutique hideaway. This unique destination was developed to embody the very best of this unique archipelago, bathed by azure skies in the aquamarine waters of the Indian Ocean. The name of this private retreat, an elegant fusion of Maldivian culture with contemporary luxury, means “Turtle Island” in the local language – named after generations of sea turtles that have flocked hereto nest and hatch. The resort design borrows from this theme, with turtle motifs, and the colors and patterns of turtle shell pervading the property. From a broader “bird’s eye view” which greets arrivals by seaplane, the island’s exclusive over-water villas are also constructed to resemble the head of a turtle, with the island forming the body. Velaa Private Island also ensures plenty of room for its marine visitors, with a hatchery and conservation plan in place. Velaa Private Island is just less than 20 hectares in size, around half a kilometer in either direction, Providing both exclusivity and privacy. Maeva! Welcome!Tahiti – Moorea – Bora Bora – island names that evoke a wonderful state of mind, seducing honeymooners, romantics, adventurers, and vacationers looking for escape. Here, around these South Seas isles, a romantic sunset sea sends giant curls of turquoise breaking onto the colorful reefs that protect the tranquil lagoons of warm, bright-emerald waters and white coral-sand beaches. With 118 islands boasting high, rugged mountain peaks, coral reefs, turquoise-blue lagoons, white sand, palm-fringed beaches, and luxuriously intimate resorts, each island paradise has something for everyone. What makes Tahiti so unique for visitors? People- Embrace the warmth of your Polynesian hosts whose love for their islands is seen through music, dance, and flowers. Overwater Bungalows- Enjoy the drama and comfort of the world’s perfect hotel room while sleeping above soothing lagoon waters. Cruising- Voyage within the legendary South Pacific aboard luxurious cruise ships, super yachts, or passenger freighter that travel between Tahiti’s most beautiful islands. Polynesian Spas- Experience true relaxation and rejuvenation at one of the many luxurious Polynesian spas while nurtured by the tropical ambience. Snorkeling & Diving- Share the warm, crystal-clear lagoons and Swift Ocean passes with schools of impossibly colored fish, docile sharks, and giant manta rays. Honeymoons & Romance- Celebrate a new romance or a special anniversary in the most romantic spot on earth. Discover how the seclusion and setting of these islands create one of the world’s most desirable honeymoon destinations. If you were here you’d be you again…Discover Tahiti…islands the way they used to be. An oasis of peace and beauty in French Polynesia. Huahine is made up of two islands, Huahine-iti and Huahine-nui, connected by a small isthmus. Unwind in your private bungalow with a Tahiti vacation to Huahine island. Explore its many charms – the ancient marae, ancient sites at Maeva and Parea, hike in the Faahia Valley, snorkel in Avea Bay, or tour of the tropical gardens and delight in an organic lunch at Eden Parc. Just a short jump from Tahiti, Moorea takes you back to a time when South Seas life followed the gentle rhythms of sea and sun. Relax at a Moorea Resort, explore ancient archaeological sites in the Punch Valley, fine-dine Polynesian style at your Moorea Hotel, scuba dive in the lagoon, or hike the lush trail from Vaiare to Paopao. Seductively beautiful, our Moorea packages will have you under their spell. 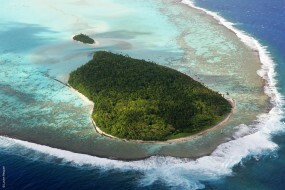 Rangiroa boasts the most excellent diving in Tahiti. Visitors to Rangiroa come to be dazzled by this remote atoll’s teeming marine life. Venture out from your Rangiroa hotel and dive through the warm currents of the Avatoru and Tiputa pass in Rangi’s coral ring; or snorkel in the tepid waters of the Blue Lagoon. Find relaxation in the pink sands of Les Sables Roses near Motu Vahituri on your Rangiroa vacation. Once at Tahiti Faa’a International Airport, you’ll find the island an ideal place to acclimate to Tahiti Vacations with its warm culture. Visit the Tahiti hotels and browse Papeete’s open-air market; later, the night-food market to feast on fresh barbeque. On your Tahiti vacation, take a guided hike in the Fautaua Valley, climb the summit of Aorai and Mt. Marau, or simply relax at your Tahiti hotel — you’ve arrived. Known for its graceful pace, Tikehau, Tahiti is a ring-shaped atoll in the Tuamotu Islands where bougainvillea lace through trees and hibiscus blooms at every corner of the Tikehau hotels. From your Tikehau resort, hire a boat and bird watch, picnic, and unwind on a palm-tree lined motu; scuba dive in the Tuheiava pass, where manta rays swim- relax in the soft ocean breeze of your Tikehau hotel beachside bungalow. River cruises are destination-based vacations providing authentic travel experiences filled with culture, art, music, history, heritage and storybook scenery. A river cruise provides the convenience of docking in the heart of cities and towns along the way, often within steps of the main town square. Most river cruises are all-inclusive: shore excursions are included as are wine and beer with lunch and dinner, while some offer complimentary cocktails and beverages all day. A journey on one of Asia’s great rivers offers a tapestry of fascinating sights, colorful cultures, and ancient traditions. A journey on these rivers gets you closer to all the must-see sights and introduces you to the locals and their way of life. The most important river in the history, culture, and economy of China, the Yangtze is the longest river in Asia and the third longest in the world. At more than 3,900 miles, it flows from the glaciers of the Tibetan Plateau across southwest, central, and eastern China before emptying into the East China Sea at Shanghai. On these fascinating Avalon river cruises you will sail approximately 650 miles through the most impressive stretch of the river, featuring the Qutang Gorge, Wu Gorge, and Xiling Gorge—collectively known as the Three Gorges. Along the way you’ll encounter village life on the riverbanks, the beauty of the mountains and river, and will visit the awe-inspiring Three Gorges Dam, the largest hydroelectric dam in the world. 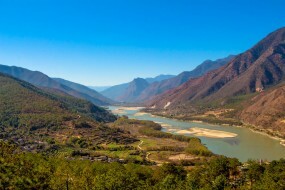 From its source high up in the Tibetan Plateau the powerful Mekong River courses for over 3,000 miles through China, Myanmar, Laos, Thailand, Cambodia, and Vietnam, providing a lifeline for millions of people. As you sail along this vibrant waterway, fascinating scenes of daily life unfold, arousing your mind and senses—the sounds of a bustling local market, opportunities to sample traditional candy and rice wine, fishermen hauling in their daily catch, and master artisans crafting works of art from silk and pure silver. By the end of your journey along the Mekong you will have a better understanding of life along the river and the friendly people who depend on it. Coursing more than 1,300 miles through central Myanmar, the Irrawaddy and its surrounding valley form the historical, cultural, and economic heart of Myanmar. From its glacial origins in the soaring Himalayas, it meanders peacefully through jungle-shrouded highlands and sun-seared plains to its mangrove-dotted delta at the Andaman Sea. The country’s largest river, this “Road to Mandalay” offers you a fascinating glimpse of “The Golden Land” that is Myanmar.